Explosion near Har Dov (Shabaa Farms) area, where two days ago IDF and Lebanese army clashed; IDF returns fire. 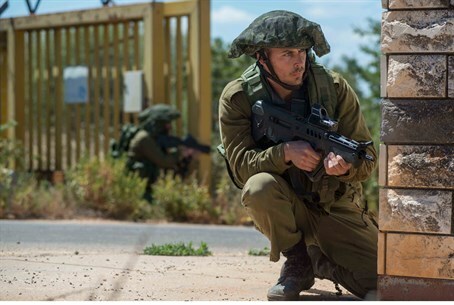 The IDF Spokesperson Unit announced that two soldiers were wounded on Tuesday afternoon by an explosive set on the Lebanese border in the Har Dov (Shabaa Farms) area. The two soldiers were defined as suffering from moderate and light wounds following the blast. "Two soldiers were injured by an explosive device. It was activated against them during activity near the Lebanon border," a military spokeswoman said. "Initial reports indicate it was intended to attack soldiers." Earlier Al-Manar, the news outlet of the Iranian-proxy terror group Hezbollah, reported on powerful explosions heard in the Har Dov area bordering Israel. According to the reports, a large quantity of smoke was seen billowing from the site. In response to the explosive attack, the Lebanese Al Meyadeen news site reported that the IDF had returned artillery fire to the area of Kfar Shouba and Al-Haraba. The report added that the explosive was detonated as an armored IDF vehicle passed adjacent to the site. The IDF dispatched two medical helicopters to the scene to evacuate the two wounded soldiers, and likewise has raised preparedness and reinforced troops in the area. Just this Sunday IDF forces clashed with the Lebanese army at the site, with the IDF opening fire on suspects who attempted to infiltrate into Israel, apparently to conduct a terror attack. Unnamed security sources said a Lebanese army soldier was wounded in the incident, leading to speculation as to whether the army was part of the infiltration attempt. Lebanese instability has led to raised tensions in Israel, as the fighting threatens to spill over the borders. Hezbollah and the Lebanese army have been engaged in fighting with the Al Qaeda-linked Nusra Front, as well as Islamic State (ISIS) forces that have infiltrated into the country. On Sunday, fighting between the sides left eight Hezbollah terrorists and 14 Nusra Front terrorists dead in the strategic eastern Qalamoun mountain region, used as an entry point for Syrian rebels to smuggle equipment to aid the fight against Syrian President Bashar Assad.